Jonathan Groff is very good in this grating revival of the pretentious cult musical about a NYC songwriter’s brain malady and its aftermath. All the songs I never wrote fizzle and remain. All the songs I did not start. All the rhymes I never made. Are welling up inside my brain. I should explain I have so many songs. I have so many songs. Inspired by his neurological diagnosis of arteriovenous malformation, or AVM, in 1992, composer-lyricist William Finn wrote a series of semi-autobiographical songs that were performed as a concert. It was then shaped into the musical A New Brain. Finn’s work as a composer-lyricist includes the modern musical theater classics March of the Falsettos and The 25th Annual Putnam County Spelling Bee that were developed and nurtured by not-for-profit institutional theaters. With a book by Finn and James Lapine, A New Brain opened Off-Broadway in 1998 at Lincoln Center’s Mitzi E. Newhouse Theater where it ran for 78 performances. It is a pretentious, egocentric cult show adored by many musical theater aficionados that is now being revived by Encores! Off-Center in an aesthetically inspired production. Gordon Michael Schwinn is a gay composer and lyricist who aspires to write for Broadway but is now a songwriter for a children’s television show. He and the producer, the bespectacled and officious Rhoda, are in a meeting. He is late in finishing “The Spring Song” and “The Yes Song.” In one of numerous fantasy sequences the TV’s show’s star, the vile Mr. Bungee, appears as his frog character to taunt him. Gordon collapses and is rushed to a hospital emergency room. There we meet the medical team, Gordon’s overbearing Jewish mother Mimi, and his effete, sailing-enthusiast boyfriend Roger Della-Bovi. Also milling about the action is a vociferous homeless woman. Illness and its effects are certainly worthy subjects of dramatization even as black comedy. Here, it is rendered with such self-indulgent exaggeration making for a painfully unfunny one hour and forty minutes. Books would make his brain explode? I will throw myself out the window. Where he’ll pee the fluid out. 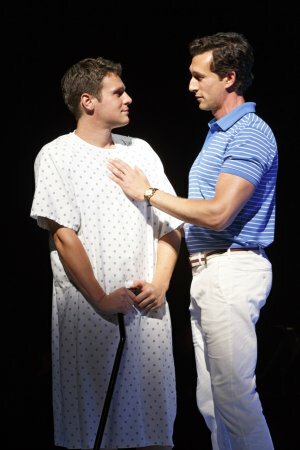 The very talented and youthful Jonathan Groff is excellent as Gordon. His charming presence known from his work on stage (Spring Awakening, Hair) and on television (Glee, Looking) adds considerably in filling out the role of Gordon. He also has the advantage of having the most developed and sympathetic part. 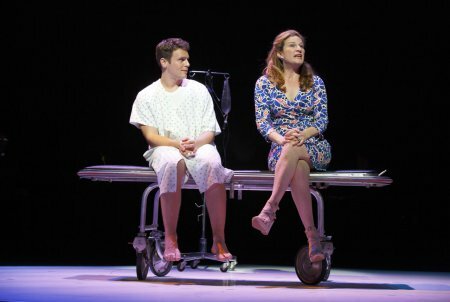 Ana Gasteyer valiantly does her best as the shrill Mimi. Saddled with a clunky “Rose’s Turn” style number called “Mother’s Gonna Make Things Fine,” she soldiers on through that and two-dimensional writing to achieve a quite likeable performance. Rotund, bearded, scraggly, and not at all funny, Dan Fogler is suitably obnoxious as Mr. Bungee. He carries himself with the supreme assurance of an indulged spoiled brat who has been acclaimed by relatives and friends since childhood. Aaron Lazar who was so dashing and commanding in the 2009 revival of A Little Night Music, is here wan as the boyfriend. It doesn’t help that the role requires him to have a sweater around his shoulders most of the time. Alyse Alan Louis as Rhoda, Rema Webb the homeless lady, Bradley Dean as the doctor, Jenni Barber as “the thin nurse,” and Josh Lamon as “the nice nurse” make very good fleeting impressions in their thin roles. With his booming voice and deep intensity, Quentin Earl Darrington is a forceful hospital minister. As abrasive as the material is, director James Lapine does a very fine job of artfully presenting it theatrically to make it visually interesting. The bare stage is in darkness and the orchestra on view in the background. Pieces of scenery appear. There is a scene in a MRI machine. A clear curtain descends as the drill the doctor holds to perform the craniotomy reaches Gordon’s head. There’s a lot of proficient stagecraft that makes the show watchable. Josh Prince’s choreography consists of a lot of arm waving and body twisting. A spooky fantasy sequence has much of the cast in head bandages in dim lighting cavorting around as if they were in Night of The Living Dead. 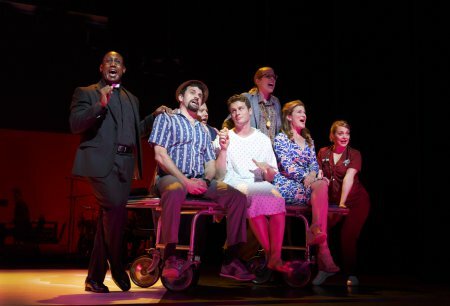 Donyale Werle’s scenic design fabulously depicts the hospital and other realistic settings as well as imaginary states of mind with simple elements. There’s also the striking large projection of an old-time anatomy skull and brain. With an amber hue and a variety of purposeful effects, Mark Barton’s lighting design gives the show a great sense of scope. Scott Lehrer’s sound design successfully blends the numerous disparate factors. The costumes by Clint Ramos are perfectly realistic creations. “Comedy is tragedy plus time,” is an old show business adage. With the passing years it is clear that A New Brain has tragedy but its comedy is forced, smug and ineffectual.